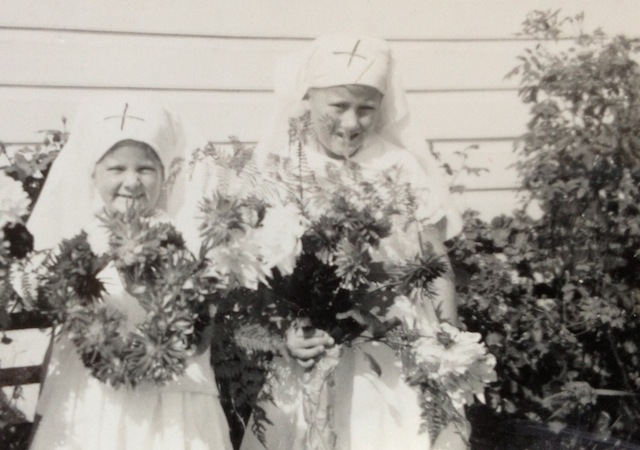 As a teenager during World War 2, I remember the Anzac Day Service held each year as being very special. The realization that we were actually ‘at war’ gave the occasion extra meaning. The procession of Red Cross Ladies, Junior Red Cross, boy scouts, girl guides and Servicemen always formed up for the march outside the Post Office. The various committees involved in the war effort were also represented – The Farewell and Welcome Home committee, The CWA Comforts Fund and Girl’s Patriotic League, all took part . 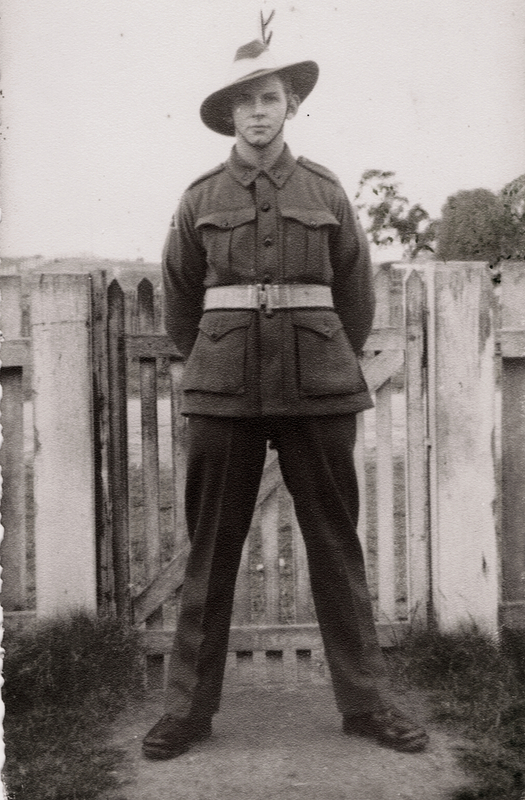 Victor Sinclair Fittock (Peter) was killed in New Guinea, 2nd May, 1945 and is buried in Wewak War Cemetery (J.B.16). Beryl corresponded with Victor (Peter) Fittock during the war and was saddened to receive a letter from Peter not long after word came through that he had been killed. At 10 o’clock the procession moved from the Post Office down the hill to the showground where the names of WW1 servicemen are displayed on an Honour Roll at the front of the grandstand. The service always began with the Recessional hymn after which an address was given by a clergyman or senior member of the armed forces. Wreaths were laid and the traditional ‘minute’s silence’ observed’. At the conclusion, a returned serviceman, Claude Muddle, played The Last Post and Reveille on his bugle. Seated in the grandstand, gazing over this peaceful setting with the clear sweet notes of the bugle ringing out, was very moving. It never failed to bring me to tears as I offered a prayer for our boys serving overseas and thanked God that Australia was not feeling the horror of all-out war as countries in other parts of the world were being subjected to. The service over, the soldiers were treated to lunch prepared by their wives, mothers and ladies of the various committees. They were then free to engage in the traditional game of ‘two-up’. (If it rained the procession was abandoned and the service held in the School Of Arts.) In time, a cenotaph was built in Memorial Avenue with the names of World War 2 veterans inscribed on it. The Anzac Day service was then held at the Cenotaph with the march starting at the hotel a short distance away. Our three children enjoyed taking part; Anne and Lyndell wearing their Junior Red Cross uniforms, Tony marching with the Cubs. In the 1980’s, the numbers of Stroud returned servicemen were so few that Stroud Returned Soldiers League was disbanded and the Hall given to the Stroud Historical Society. The Anzac Day service was then discontinued. Anyone wishing to attend a service went to Dungog or Karuah. Anzac Day in Stroud was revived in 2006, due to the efforts of the Anglican minister Hayden Mackellar and Baptist pastor Steve Harris. They were ably supported by the Dungog branch of the RSL and each year since, Dungog has supplied a number of uniformed service men which gives a strong military presence to the occasion. The inclusion of the Stroud Choir is a welcome part of the proceedings. The organisers are very pleased with the numbers – young and old – that regularly attends.